A blessed Easter Season to each and all of you from Cabrini Ministries in Swaziland. The Lenten and Easter Seasons are a time to reflect on the life, death, and resurrection of Jesus. Here in Swaziland Sr. Barbara and I do this by reflecting, discussing, and meditating on the life, passion, death, and resurrection of Jesus as described in the Scriptures and in the ongoing life, passion, death, and resurrection of Jesus in the people and situations which Cabrini Ministries serves. This Passion of Christ as described in Isaiah continues today in so many countries in this world. 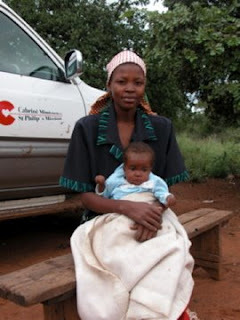 We see it continuing in Swaziland as it is crushed by suffering – small, forgotten, powerless in the grand scheme of things, made weaker and weaker by the loss of grandparents, parents, children, brothers, sisters, cousins to HIV, AIDS and TB. In the midst of humiliation, powerlessness, and suffering Jesus knew He was deeply loved by God and trusted God to save Him. The people of Swaziland served by Cabrini Ministries also know and trust in God’s love and salvation each day. How is that possible? It is possible through the great kindnesses and help received from friends and benefactors like yourselves. There is new life and resurrection each time the children, the sick, the hungry, and homeless here in the lowveld know that education, medicine, food, shelter, clothing are available to them through your generosity. With great resilience the people gain hope from each kindness received. We wish to thank you for bringing resurrection all through the year to thousands served here by your generosity. God is not outdone…you will receive more than you can ever give. Looking through the recent photos we took of the orphans at the hostel for sponsorship (Click here for more info about sponsorship), we were reminded that each child and teenager have their own distinctly individual personalities, backgrounds, and care requirements. It is the same with our healthcare patients. When we are trying to deal with a complicated problem like HIV/AIDS and its secondary effects on a society, such as tuberculosis infection, poverty, and orphaned children, we’ve realized that the only way to tackle it is to take each individual on a case-by-case basis, one person at a time. This approach takes huge commitment, as it is labor intensive, organizationally intensive, and resource intensive. But, we believe it is the only way to make real change. Considering problems like HIV/AIDS in Swaziland, it is easy for outsiders to just hear numbers and statistics, and lose connection to the people that are facing these issues. Here is a statistic: UNICEF says by 2010 there will be 150,000 orphans and vulnerable children under the age of 15 in Swaziland. Here is the human reality of it: How can this many vulnerable children be on their own? Knowing how much individual care and love each child on this earth needs for their development, the reality of these statistics is heartbreaking. But we move forwards, one unique child at a time, and try to support their growth and healing- physically, mentally, emotionally, and spiritually. Each child, and each person, is precious and wonderful. Below is a link to an article about the thousands of orphans in the small country that cannot afford the fees to go to school (there is no public school in Swaziland), and how the government is failing on their promise to support them. Thanks for your support- it really makes a difference in these individual lives.